Before I came across this graphic novel, I never felt like Edgar Allan Poe’s writing seemed disturbing or suspenseful, most likely because I’ve always had a hard time picturing what he was saying. Out of sheer curiosity I picked up this graphic novel hoping it would be up to the challenge of depicting Poe’s frightening work and sure enough, I definitely got what I wanted. Ten of Poe’s works have been primarily adapted by Rich Margopoulos and each of Poe’s original work follows the adaptation. I found myself very entertained in reading some of the adaptations because a different outcome might be presented compared to the original work. This then made me want to read Poe’s original work more careful and keep in mind what was different and similar. In the end, I wanted to compare and contrast the adaptation to the original and see if my understanding of both versions were the same or not. I was also thrilled to see that each adaptation was in a different setting: 19-century, country side graveyard, post-apocalyptic future, and even a high school reunion. I don’t think I’ve ever felt so connected to Poe until now. Richard Corben’s well known for a number of horror comic titles, so who better to give the task to depict disturbing, frightening images than Corben? His style captures the entire essence of what feelings Poe most likely wanted to inflict upon his readers. Each story is beautifully drawn in black and white with tremendous details and definitely caused me to slow down my reading to examine each page. I will say again: Disturbing images are probably what stand out the most about this graphic novel. This graphic novel is meant not to disgust but portray the horrors of what Poe’s work may have represented from the writer/artist’s perspective. The examination of language and words would be an interesting aspect to explore. What words or phrases does Margopoulos choose as inspiration from Poe? Does this technique work well? Is Margopoulos’ tone similar to Poe’s? Why do you think some of the adaptations have a different ending than Poe’s original work? In regards to the different ending, I found this to be very intriguing because Margopoulos seemed to have his own perspective of what is horror or frightening story telling. Also, some of the endings from the adaptations were an actual conclusion, compared to Poe’s original work that could possibly leave a reader with an open interpretation. The adaptations felt like a great way for me to get into reading Poe’s original work and with keeping the adaptation in mind, I could pin point where the original work starts to differ compared to the adaptation. I really like the idea of reading an adaptation with the writer’s personal touch to it because I become open to forming my own interpretations or at least considering the work from a different perspective. The images are also a notable part for discussion as well, since after reading the adaptation, the reader is given the original work in traditional text. What images were you imagining when you read the original work? Do you think you would have had a difficult time imagining what you were reading if you didn’t read the adaptation first? Having students explore the writing and images in this graphic novel could lead students to understand word choice, tone, and the significance of different perspectives. 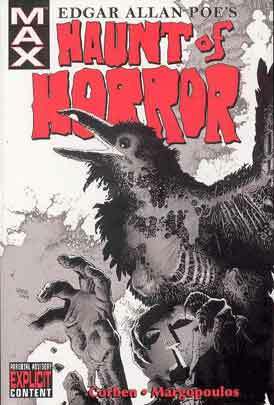 This graphic novel is also a great collection of only some of Poe’s poems and stories.